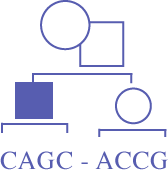 Members are entitled to join CAGC committees and contribute to projects that promote the genetic counselling profession in Canada. Full members are granted voting authority on important issues brought forward at the annual general meeting. Representatives from the CAGC have input into clinical practice guidelines issued by the Canadian College of Medical Geneticists, and the Society of Obstetricians and Gynecologists of Canada. Access to the CAGC e-mail listserv, which is an excellent forum for sharing information and networking. Online membership directory, which provides contact information for all CAGC members worldwide. Access to the CAGC Genetics Knowledge Dissemination Speaker's Bursary, which supports genetic counsellors at non-genetics conferences. Direct e-mail notification of job postings to CAGC members. Access to Professional Status Survey, including information regarding genetic counsellor salary, benefits, and faculty appointments. Discounted rates for the Annual Education Conference. Access to CAGC’s newsletter “Crossover”. Need a reason to join the CAGC? See our new promo video here!